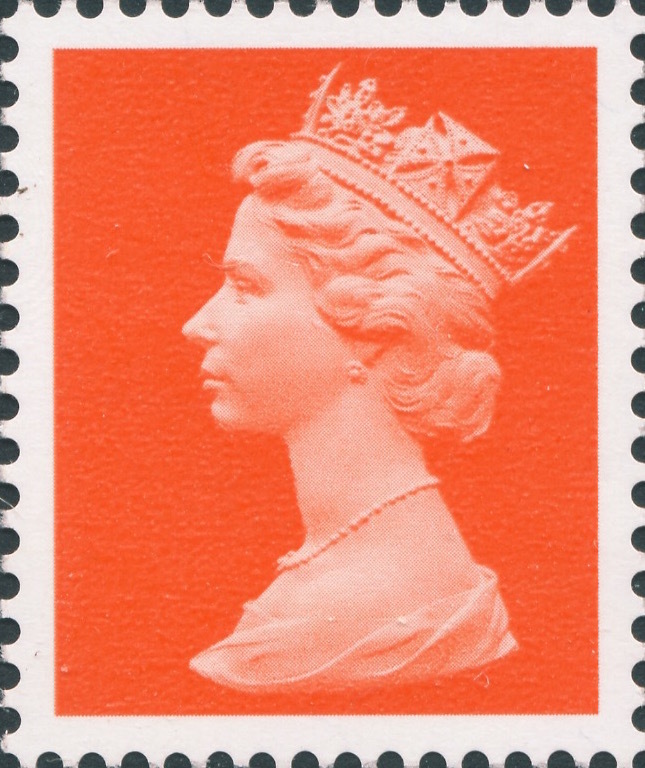 Complete sheets of three trials of the Machin head, produced in 1997, have just come to light in this, the 50th anniversary of the introduction of Arnold Machin’s iconic portrait of Queen Elizabeth II. So Royal Mail permitted Questa to approach Helio Courvoisier SA of Switzerland, probably with a view to subcontracting the gravure printing. The undenominated trials were undertaken on 20 October 1997 in sheets of 100 with the Courvoisier imprint along the vertical margins. They exist in three colours: deep green (as used for the 2p), light grey (as used at the time for the 29p), and flame (as used for 1st class). Courvoisier had been printing the then current Kenya definitives, and these trials are printed on the same coated paper, without phosphor bands, and have perforation 15 x 14 (although the stamp image is slightly smaller than that used on Machin definitives. reading upwards in the side margins. The sheets are perforated on the outer left margin (though the perforations are almost completely guillotined off on the flame sheet), suggesting panes of two. Sheet numbers are in the lower right corner, with the grey sheet showing (0)10531 though it is not known whether the numbering was reset for this trial, so this is no indication of the total numbers produced. In the event Courvoisier had no further involvement in producing Machins. Questa, having been acquired by MDC Corporation, moved to premises in Byfleet, Surrey, where it had gravure facilities. The total quantity of panes printed is unknown at this time, but they are now in private ownership. 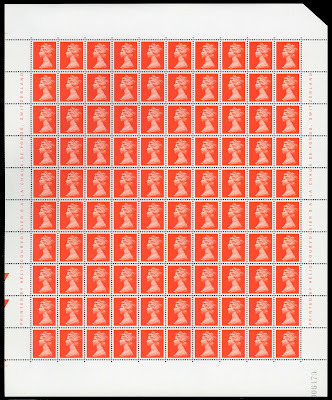 Allan Grant of Rushstamps has arranged for a set of the sheets to be donated to the new Postal Museum in London, and they will be on display at Spring Stampex (15-18 February) in London's Business Design Centre. Stanley Gibbons has confirmed that they will be included in the next edition of their GB Specialised Catalogue Volume 4, Part 2 (Decimal Definitive issues). According to US magazine Linn's Weekly. Daniel F. Kelleher Auctions of Danbury, Conn, USA is representing the owner, who “has not put forth plans for a sale”. Collectors interested in the trials should contact Rick Penko at Kellehers (www.kelleherauctions.com). How much would you pay for a set of the stamps?! Note, a number of people have mentioned the £5 brown De La Rue printing, and the trials with 00 values. Whilst interesting those post-date these, so are irrelevant to this particular subject. Interesting to see that they don't have elliptical perfs. Now these are something to covet. I did a display including a whole bunch of Machin trials at the GBPS meeting this last weekend. 10 years ago you wouldn't have seen much Machin material in such an event, it would have all been GB Line Engraved. Saturday's non-postal history displays had no Line Engraved and 3 Machin exhibits.....admittedly two of them from yours truly. I would love to have these. The fact that they exist in full sheets and clearly multiple sheets (since some have been donated) should keep the value down a bit, that and the fact that they didn't lead to a released stamp. Nonetheless a very interesting piece and something I could happily make room for. One thought.....to be truly collectable, these would need the provenance provided in a properly evidenced form....not just the auction house or current owners word for it. I believe all that exists: whether or not it, or copies of it, accompanies the donation to the Postal Museum I don't know. I shall try to find out when I see the sheets at Stampex. The big question for me would be why these have taken 20 years to appear, and what that provenance would then mean. I emailed Kellehers auction house in the US last night to ask about the provenance and their reply was short but stated that they had checked and validated. I may well make a trip to Stampex to speak to them and see what they have and say. Larry's post dated 30/01 on the machin mania blog machinmania.blogspot.co.uk refers you to an article in Linns. The article is at http://www.linns.com/news/world-stamps-postal-history/2017/january/machin-stamp-trial-color-panes-resurface-royal-mail-definitive-stamps.html. The Linns article illustrates the three sheets. But two of them appear to be different sheets from the ones you illustrate. The grey and flame sheets in Linns have the top left corner cut off. The ones you illustrate have the top right corner cut off. Rushstamps latest list dropped on my doormat this morning. In it Allan has these trials mentioned near the end with a note "further details on request". I am guessing therefore that he has at least a sheet of each beyond the donated ones and the ones that Kelleher have; otherwise why would he invite enquiries, since he already donated a set to the NPM - surely he wouldn't have done that to then buy what Kelleher have. I have asked for more info, since the volume obviously has a huge effect on value. In answer to your question. How much would you pay for a set of the stamps?! £1 each £3 in total. Especially not knowing how many exist. I imagine enough do exist for all collectors and Rushstamps normally start with high prices and reduce them as the years go by. So i will wait for a few years. I would hazard a guess that only a few hundred sets still exist. So at £150 for a set of three I doubt anyone would be out of pocket in the future, if that is all anyone is concerned about. As a collector, I've placed my order for a set as it's an unusual and interesting part of Machin history.